Ready or not, it's that time of the year again: Back-to-school season. And whether that means you're rushing off to night classes, scurrying to get out the door, or simply trying to keep track of your family's complex schedule — everyone could use a little help. Especially during dinnertime. So we put together a cheat sheet of seven easy and ultra-practical dinners that you can dress up or down to make everyone in your family happy. You can mix and match them, cook 'em all, or make the same one again and again — it's totally up to you! The recipes were designed to be easy to put together, convenient, and crowd-pleasing — because we totally understand how hectic back-to-school season can be. To make things easier, we created grocery lists for each recipe. And if you plan to make all seven dinners in one week (which you totally can!) we made a master list that'll set you up for the entire week. We also made a list of all the kitchen equipment we used — such as pots, pans, and knives— to make sure you were set. Ready to dive into the recipes? You can get a printable PDF file, or you can get the full recipes at the bottom of this post. Let's do it! Everybody loves a good tater tot casserole — it’s practically impossible to dislike them — but they’re not always the healthiest. This version sneaks in a ton of veggies (like corn, carrots, and tomatoes) without sacrificing any of the indulgence. In fact, we think your kids (or you) won’t even notice! The recipe is super flexible. You can pretty much swap in whatever veggies you want. We even made it with chopped cauliflower and it worked great. To serve, just garnish with cilantro, tomatoes, avocado, or anything else you want to jazz it up! Just sauté whatever veggies you like (we used carrots, black beans, and corn) and add some milk and flour to make a sauce. Throw in some cheese, top with tater tots (! ), and bake until bubbling. Slow cooker chili is the MVP of weeknight dinners. Just throw everything in before work and come home to a hot dinner ready to be enjoyed. This version takes it even further and cooks cornbread dumplings with the chili. As soon as you get home, just scoop some cornbread batter on top of the cooked chili, give it another hour or so, and they’ll be good to go. For the dumplings, you'll need butter, brown sugar, eggs, milk, flour, cornmeal, baking powder, and cheddar cheese — but you can totally leave them out if you want. Just load everything into a slow cooker, let it cook all day, then dollop with a simple cornbread batter. After an hour or so, the dumplings will be tender and cooked through, and dinner is ready. Dress it up: Garnish with cilantro, green onions, and jalapeño — or leave it plain for a comforting classic. Everybody loves crispy chicken strips. This recipe gives you that crispy, pan-fried chicken texture, but it bakes them instead. And it packs in two different kinds of vegetables so you can have a complete meal that’s ready in no time. Oh, and it's the perfect occasion to go wild with the dipping sauces. Bread some chicken strips in flour, egg, and breadcrumbs, and load onto a sheet pan. 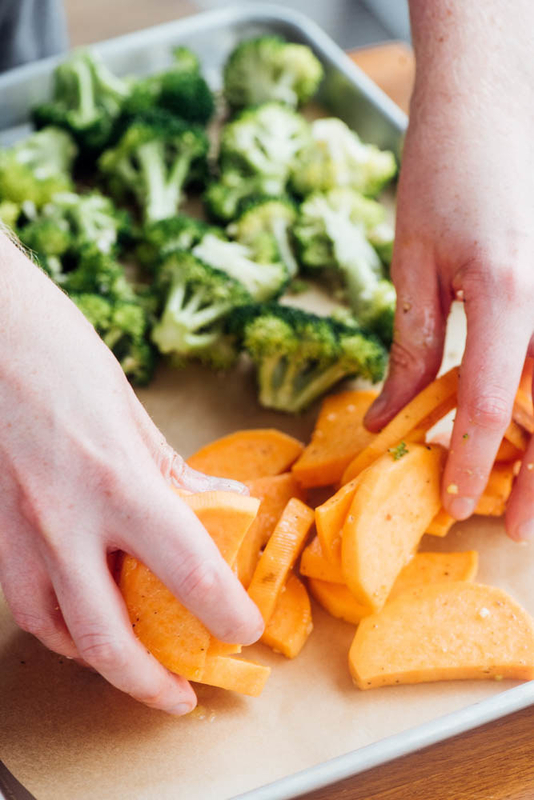 Then toss some sweet potato slices and broccoli with oil and seasonings, and place on another sheet tray. Bake 'em both at the same time, then serve with dipping sauces. Instant ramen is the ultimate weeknight dinner. It’s quick, easy, and ridiculously cheap — but it’s not always that tasty or filling. This recipe completely transforms the staple into a satisfying, no-boil stir-fry your whole family will love. It’s like your favorite take-out meal, only homemade and on the table in less than 20 minutes. Yep, just the plain ol' blocks of instant ramen. They work perfect in this recipe! Dress it up: Garnish with some green onions, cilantro, and sesame seeds. 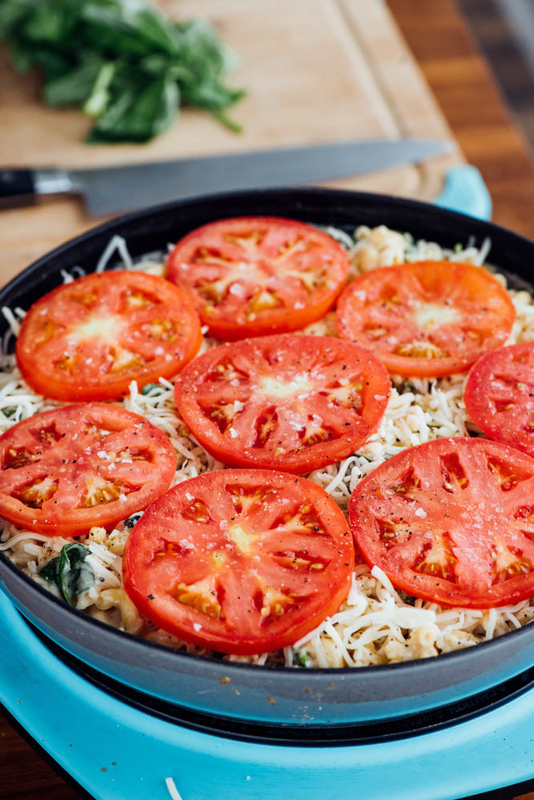 This classic mac 'n' cheese skillet is the perfect recipe for picky eaters of all ages — and once you add the roasted tomatoes and fresh basil on top, it turns into something that’s fresh, flavorful, and exciting. The tomatoes and basil are for garnishing — but feel free to leave them out . 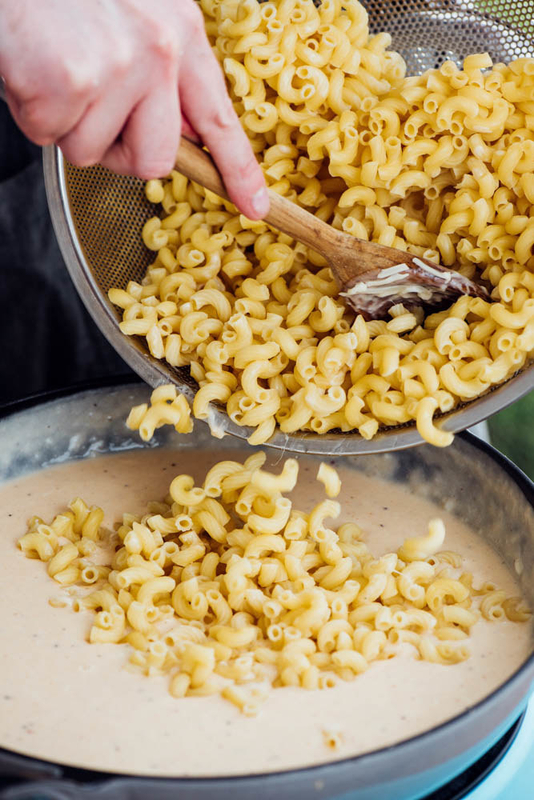 Make a quick sauce with flour, butter, milk, and cheese — then throw in cooked pasta. Fold in some spinach, top with some more cheese, and bake until bubbling. What’s better than pizza night? A build-your-own-pizza night! These clever French bread pizzas are quick and easy to throw together so you can make everyone their own personal favorite without putting in a ton of work. Just cut some baguettes in half, spread on some sauce (tomato, BBQ, Ranch — whatever you want! ), pile on the toppings, and pop 'em in the oven. Someone doesn't like tomatoes? Leave 'em off. Someone loves pepperoni? Load it up! The BYO aspect allows everyone to build a pizza they like. Think of this taco recipe as a complete meal kit in one. 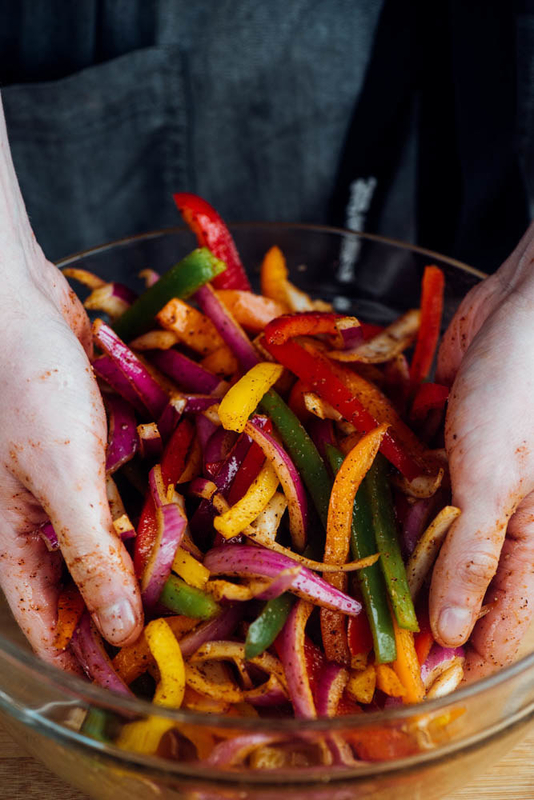 Just quickly roast some veggies and steak together on a sheet tray (along with some tortillas to warm ‘em up) then serve it with a bunch of toppings. Put it out and let everyone serve themselves — building their dream tacos with as many (or as little) toppings as they want. And whatever toppings your family loves — we recommend all kinds of things from guacamole, to shredded cheese, to homemade lime crema (which we included a recipe for). Toss sliced onions and bell peppers with oil and a homemade taco seasoning, and place onto a sheet tray. Using that same spice blend, season up some flank steak, roast with the veggies (either on the same pan or an additional one), and serve with tortillas. We warmed our tortillas in a foil packet right alongside the veggies to make it easier. Dress it up: This is where you can get crazy. As the steak and veggies are cooking, set up a BYO taco bar with all your favorite toppings — from guacamole to shredded cheese. Ready to get cooking? Get printable recipes, a grocery list, or just keep scrolling. We would love to see your creations! If you end up making these recipes, tag your photos with #TastyBTSMealPlan and we'll feature our favorites! 2. Cut the head of cauliflower in half, remove the stem, and chop into small pieces. Set aside. 3. Heat the oil in a large cast-iron skillet over medium heat. Add the garlic and onion and cook until fragrant, about 2 minutes. 4. 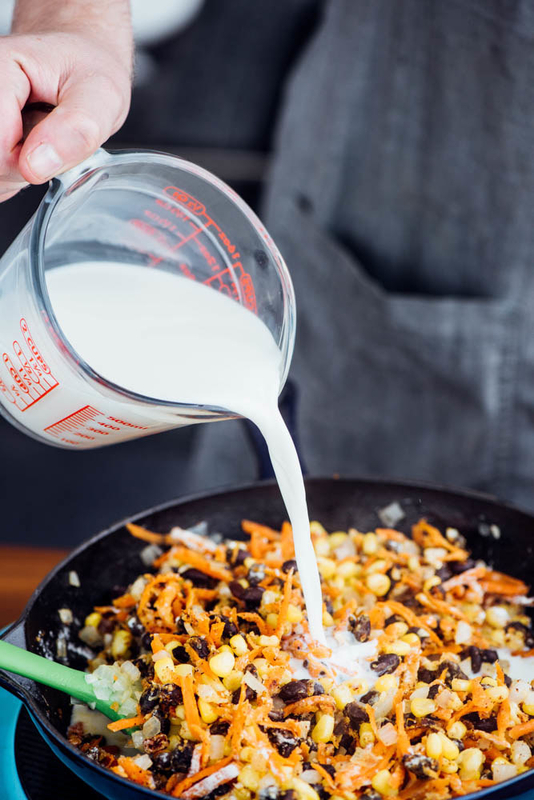 Add the corn, carrots, black beans, and 2 cups of cauliflower and cook, stirring often, for another 3 minutes, until the corn starts to brown around the edges. 5. Add the flour, chili powder, and salt and stir until the vegetables are evenly coated. 6. Add the milk and diced tomatoes and cook, stirring constantly, until thickened, about 3 minutes. 7. Add the mozzarella cheese and stir until melted. 8. 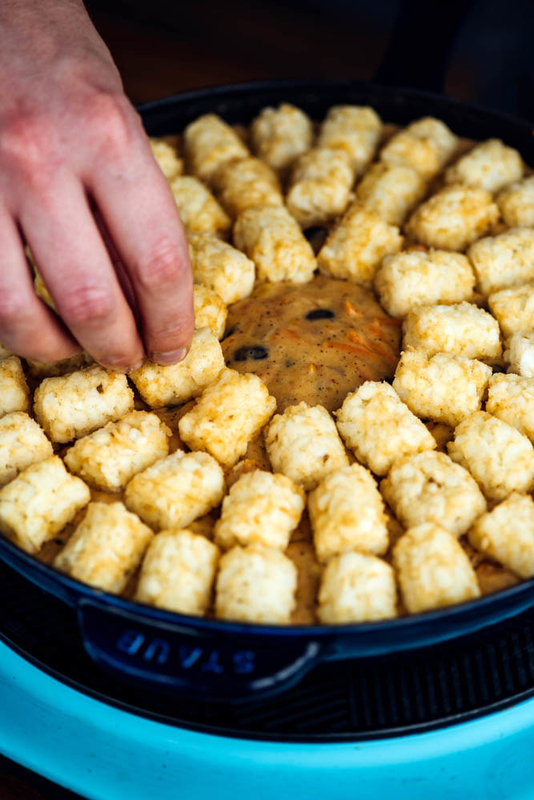 Turn off the heat and arrange the tater tots on top of the vegetable mixture. 9. Transfer to the oven and bake until browned and bubbling, about 30 minutes. 10. Garnish the casserole with tomato, red onion, jalapeño, and cilantro, if using. Note: Feel free to add the garnishes to only half of the casserole so everyone can enjoy. Also, if your family is a fan of spicy foods, feel free to add half a minced jalapeño along with the garlic and onion for a pop of heat. *Vegan Substitution: Omit the shredded mozzarella and milk and replace with your favorite vegan cheese and milk alternatives. 1. Make the chili: Combine the ground turkey, onion, bell peppers, garlic, crushed tomatoes, black and kidney beans, corn, chili powder, salt, and pepper in the bowl of a slow cooker and cook on low for 6-8 hours or high for 4 hours. 3. Once the chili has cooked for 6-8 hours, make the dumplings: Combine the melted butter, brown sugar, eggs, and milk in a large bowl. Add the flour, cornmeal, baking powder, and salt and stir until smooth. Fold in the cheese. 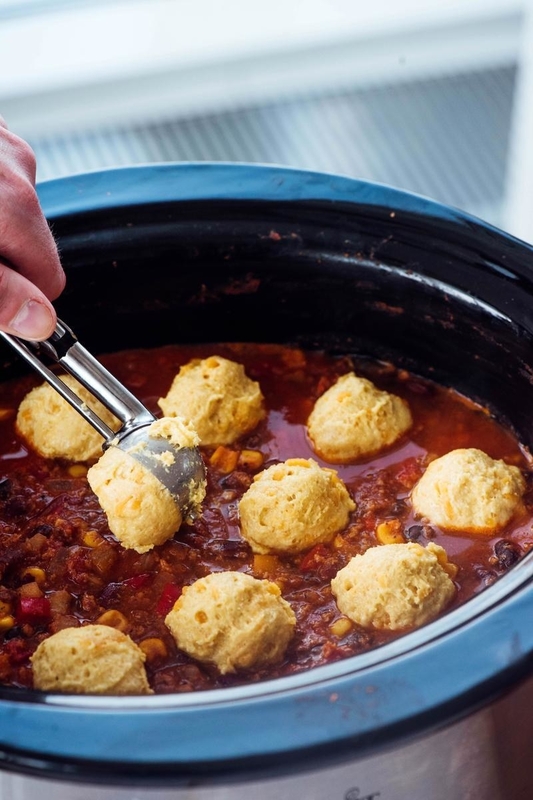 Using a small ice cream scoop, dollop the batter on top of the chili and cook for 1 more hour on high, until the dumplings are puffed and tender. 4. If using, garnish the chili with jalapeño slices, cilantro, and green onions. Note: To make this on a weekday, get the chili cooking before work and scoop the cornbread batter on as soon as you get home. Within an hour, the dumplings will be cooked through and ready. If you’re using an oven, cook the chili in a heavy dutch oven at 320°F degrees for 2 hours, checking often. During the last 20 minutes of cooking, add the dumplings. *Vegan/Vegetarian Substitution: Omit the shredded turkey and replace with additional beans. Omit the cornbread. 1. Preheat the oven to 375°F (190˚C) and line 2 baking sheets with parchment paper. 2. Slice the chicken breasts into strips. 3. In a medium bowl, add the eggs and 1 tablespoon of olive oil. Whisk to combine. 4. 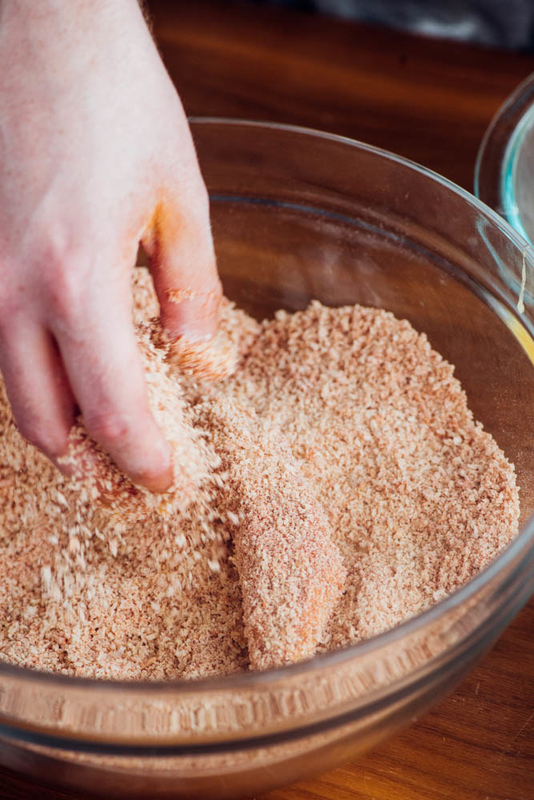 In a large bowl, combine the panko bread crumbs, paprika, and 1 teaspoon of salt. 5. Place the flour in another medium bowl. 6. Coat the chicken strips in the flour, then in the eggs, then in the bread crumbs and place on a baking sheet. 7. Cut the broccoli into florets. Note: Paprika gives the chicken tenders a golden color and subtle flavor, but feel free to omit it. *Vegan/Vegetarian Substitution: Replace the breaded chicken strips with your favorite vegan protein or load up on veggies and roast a third vegetable in place of chicken. 1. 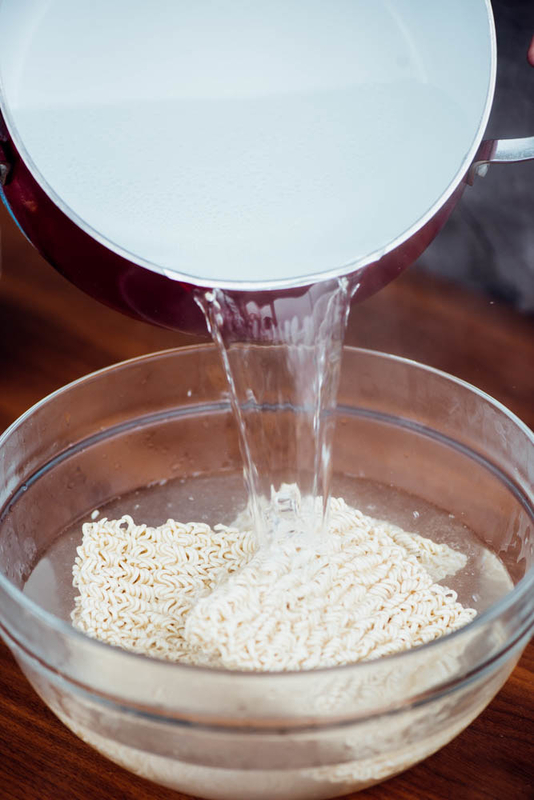 Place the ramen noodles in a large bowl (discard the seasoning packets or save for another use) and pour the boiling water over them. Let sit for 6 minutes, stirring every now and then to break up the noodle blocks. Drain and rinse under cold water. Set aside. 2. In a small bowl, combine the garlic, cornstarch, sesame oil, lime juice, and soy sauce. Stir well, then set aside. 3. Place the broccoli in a large, microwave-safe bowl and microwave for 1½ minutes, until soft. Set aside. 4. Heat 1 teaspoon of olive oil in a large, nonstick pan over high heat. Add the steak to the pan and toss with 2 tablespoons of the reserved sauce. Cook until browned, about 2 minutes. Remove from the pan and set aside. 5. Heat another teaspoon of olive oil in the pan, then add the onion. Cook, stirring often, until browned, about 4 minutes. 6. Add the broccoli and cook until lightly browned, about 2 minutes. Remove from the pan and set aside. 7. Add the remaining teaspoon of olive oil to the pan, then add the noodles and the remaining sauce. Cook, stirring constantly, until the noodles soak up the sauce. Return the cooked vegetables and steak to the pan and stir to distribute. 8. Transfer the noodles to a serving dish and garnish with green onions, cilantro, and sesame seeds, if using. 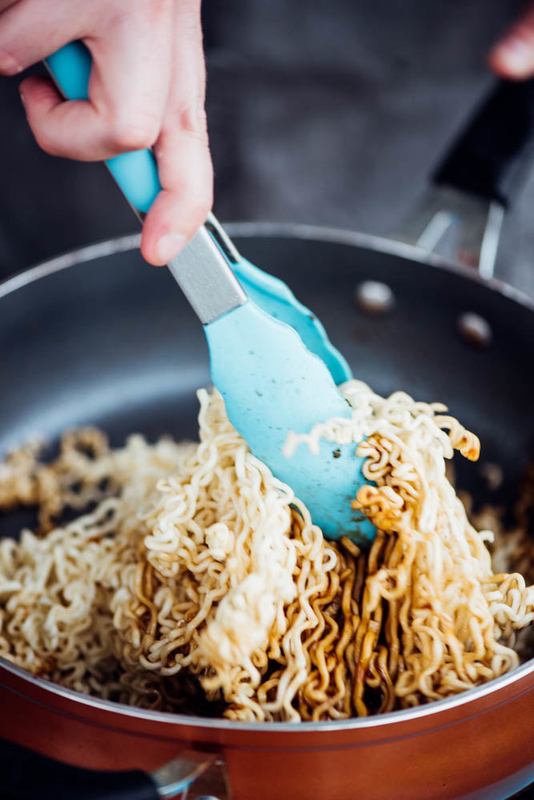 Note: Make sure to use a large nonstick pan when frying the noodles to avoid sticking. If using a low-sodium soy sauce, feel free to season noodles with kosher salt. *Vegan/Vegetarian Substitution: Omit the steak and replace with tofu, edamame, or scrambled eggs for additional protein. 1. Preheat the oven to 350°F (180°C) and line 2 baking sheets with parchment paper. 2. Arrange the baguette pieces on the baking sheets, cut-side up. 3. To make the margherita pizzas, spread 2 baguette pieces with the tomato sauce and top with the shredded mozzarella, cherry tomatoes, mozzarella balls, and basil. 4. To make the BBQ chicken pizzas, spread 2 baguette pieces with the BBQ sauce and top with the shredded chicken, shredded mozzarella, and red onion. 5. 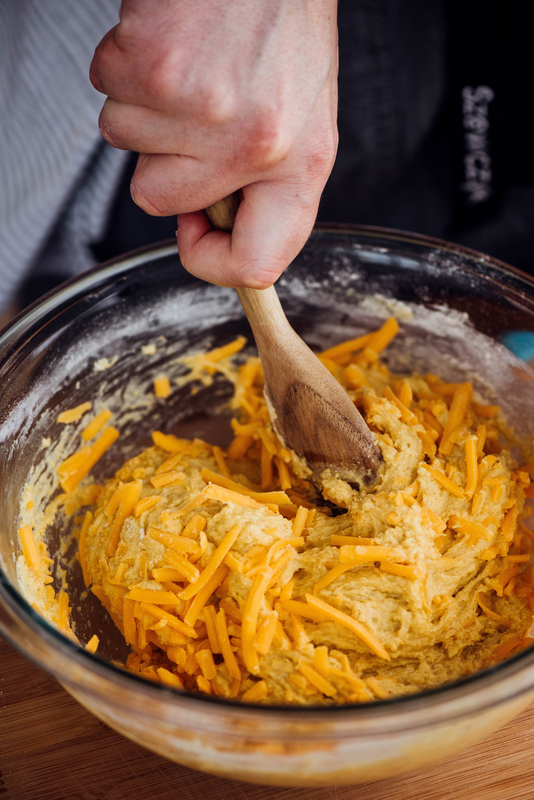 Bake until the cheese is browned and bubbling, about 10 minutes. 6. If using, garnish the margherita pizzas with chopped basil and red pepper flakes and the BBQ chicken pizzas with green onions. Note: A written, this recipes makes 2 margherita pizzas and 2 BBQ chicken pizzas, but feel free to mix, match, and set out ingredients your family loves to customize them to everyone’s tastes. *Vegan/Vegetarian Substitution: Omit the chicken and replace the shredded mozzarella with your favorite vegan cheese alternative. 1. Preheat the oven to 350°F (180°C) and line two baking sheets with parchment paper. 2. Make the DIY taco seasoning: Mix the salt, pepper, cumin, garlic powder, and chili powder together in a small bowl. 3. Add the flank steak to a baking sheet. Drizzle with 2 teaspoons of olive oil and rub to coat, then sprinkle with 2 teaspoons of the taco seasoning and rub to coat evenly. 4. To the other baking sheet, add the green bell pepper, mushrooms, red bell pepper, red onion, and broccoli. Drizzle with 1 tablespoon of olive oil and sprinkle with 2 teaspoons of taco seasoning. Toss to coat. 5. 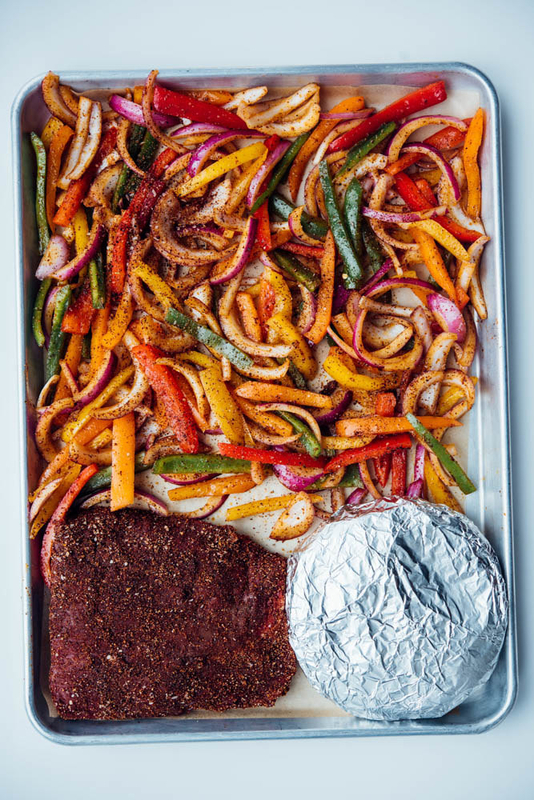 Wrap the tortillas in foil, add to the baking sheet with veggies, and bake until the vegetables are browned and the steak is cooked to your liking, about 20 minutes. Let rest for 5 minutes, then thinly slice the steak against the grain. 6. Make the lime crema: combine the Greek yogurt, lime juice, and zest in a small bowl. Season with salt. 7. Serve the roasted steak and vegetables with the lime crema and your family's favorite toppings to create a DIY taco bar. Note: Feel free to serve with your family’s favorite toppings to create a taco bar that’ll make everyone happy. *Vegan/Vegetarian Substitution: Omit the steak and serve with 1 cup black beans for added protein. Recipes by Jesse Szewczyk; photos by Taylor Miller; videos produced by Pierce Abernathy; edited by Melissa Harrison and Marie Telling.